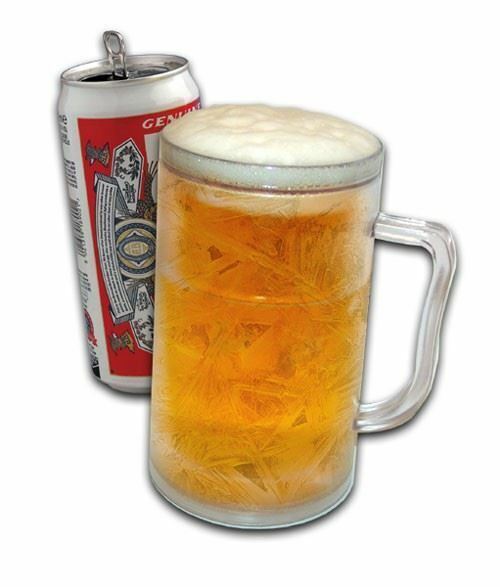 You'll find these wondrous frosty Mugs keep your beer (or other beverage) colder than an Eskimo's whatsit. One very cool Beer Ice Tankard. They're the perfect chilling system for beer and lager because who in their right mind would want to commit the cardinal sin of diluting beer with ice cubes?. If you like your larger nice & cold like me then this is for you. I've got three of these so two are always freezing whilst I'm using one. Only down side is that it does not hold a 440ml can like the description says. Excellent product for my nightly beer or cider. Keeps the drink well chilled. does the job but dislike the sort of countersink at the top of the tankard which tends to make me slurp. Not sure about this beer glass it's a bit clumsy and only holds about half a pint even though it looks like a pint glass, just not very enjoyable to drink out of, does keep it cold but you end up with ice flaking off into the beer whilst drinking and that just ain't right 🍺. Ok. But it's just to small. I would have given it 5 stars, if the beer mug had been full size.